This editorial addresses the jurisdictional challenges for decision-making about which coroners should exercise jurisdiction over a dead body, when more than one has the potential to do so, including when a tragedy has occurred involving deceased persons ordinarily residing in diverse jurisdictions. It considers the criteria that are applied and should be applied by coroners to assumption of jurisdiction in relation to overseas deaths and reflects on considerations relevant to the exercise of such decision-making. It reviews significant cases, including appellate case law, in relation to coroners’ investigations of overseas deaths and concludes by reflecting upon the need for consistent legislation throughout Australia and New Zealand on exercise of jurisdiction by coroners. It considers the expedient of a federal coroner for Australia. In 2018 the United Kingdom Supreme Court decided in An NHS Trust v Y  3 WLR 751;  UKSC 46 that the time had come to move on from the “good practice” requirement in Airedale NHS Trust v Bland  AC 789 for hospitals and doctors to obtain court approval before life-prolonging treatment can be withheld or withdrawn from a patient in a permanent vegetative state (PVS). It held that it is no longer necessary to involve the court in every case before life-sustaining clinically assisted nutrition and hydration (CANH) can be withdrawn. Provided the provisions of the Mental Capacity Act 2005 (England and Wales) and relevant professional guidance are followed, and there is no difference of medical opinion or lack of agreement from interested parties, in particular family members, with the proposed course of action, legal permission is not required. The ruling applies to PVS patients, as well as, more controversially, those in a minimally conscious state (MCS), the newer diagnosis identified post-Bland. This commentary summarises the Supreme Court’s decision, and considers some implications for England and Wales, as well as for Australia and New Zealand, where there is no recommended practice of, much less any legal requirement for hospitals to seek court approval, even in disputed cases. For most prospective mothers, pain in childbirth is their greatest fear. However, intolerable labour pain should no longer be accepted by the health professions. Without adequate pain control in labour fetal damage can be significant. Moreover, if relief from pain is a fundamental human right then surely standards of good obstetric care should include a definition of adequate pain relief in labour and obstetricians should pay due attention to alleviating that pain. At present actions in tort focus on poor medical management of injuries or diseases. Pain and suffering are generally a secondary consequence of that negligence although in the tort of negligence pain can constitute damage. However, it is argued that failure to address pain adequately as a primary issue should be considered medical malpractice or at least unsatisfactory professional performance if there is proof of failure to exercise reasonable care. The possibilities for untreated labour pain to be deemed medical negligence could include maternal post-traumatic stress disorder, fetal brain injury resulting from maternal acidosis and utero-placental hypo-perfusion or even negligent infliction of mental harm on the family members witnessing their family relative in intolerable pain. In this article the nature of labour pain and its fetal effects will be discussed. Effective pain control in labour should be good medicine as well as humane treatment. An advance care directive (ACD) is a written expression of a person’s preferences in relation to health care, which can appoint a trusted substitute decision-maker, describe personal values, and make explicit decisions consenting to, or refusing, certain treatments. When a person with a directive refusing life-sustaining treatments attempts suicide, opinions are divided as to the degree to which health care staff are bound by such a directive. In this section, I will provide an example of a patient who presents to hospital after attempting suicide who has a valid ACD refusing life-sustaining treatment. I will then describe the legislation relevant to ACDs in Victoria, Australia and ethical arguments relating to the application of an ACD in this context. I will present a decision-making algorithm for health care staff faced with the difficult decisions arising from such a presentation. In 2017/2018 the Australian Capital Territory held its first citizens’ jury to deliberate changes to the Territory’s Compulsory Third Party (CTP) insurance scheme, for injury compensation after motor vehicle accidents. Such citizens’ juries were designed to aid the transition to next-generation parliamentary processes (such as liquid democracy – citizen direct electronic voting on laws or individual transfer of their vote to respected politicians) by enabling a variety of key stakeholders and interests to be actively represented in the process of statutory development. In effect such a process is a democratic alternative to the current model of corporate lobbyists covertly influencing the legislative process. This column investigates how the citizens’ jury chose one from four proposed CTP models. It then critiques how, following the jury’s recommendation, the Australian Capital Territory Government introduced the Motor Accidents Injuries Bill 2018 (ACT). Once enacted, this is designed to create a “no-fault” expedited scheme, but on our analysis, at the cost of certain adverse outcomes. These include greatly reducing an injured person’s entitlements to fair compensation, a “whole person impairment threshold” that limits entitlements to treatment and care, wage loss and compensation for pain and suffering, removing the right to compensation for gratuitous care, and giving the insurance companies unfettered power over the provision of entitlements. This article arises from a summary offered by the author to an international conference held at Wilton Park, England, on policy and action necessary to respond effectively to the epidemics caused by the Human Immunodeficiency Virus (HIV) and Hepatitis C Virus (HCV). The article begins with 10 lessons derived by the author from his involvement with the HIV epidemic since 1989. These lessons compare and contrast the features of the HIV/AIDS epidemic and those of the HCV epidemic. Although there is overlap between the persons exposed to the respective viruses, HCV is different in two important respects. First, unlike HIV, Hepatitis C can be cured with available but usually expensive therapy. No cure or vaccine has yet been developed for HIV. Second, HIV resulted in a major international response stimulated by engagement with people living with that virus. HCV attracts event greater stigma. Because of national and international treaty law and national criminal law, stigma is even greater in the case of HCV. The article identifies 10 lessons to be learned, including the need for reform of national and international drug control law. It concludes with a list of urgent initiatives that are needed globally to combat the growing but treatable HCV epidemic. Therapeutic privilege is conceptualised as a defence to a negligence claim available to a medical practitioner, where the negligence alleged is a failure to warn. It affords a practitioner an opportunity to prove that the failure to warn was because of a belief that disclosure of a material risk would prove damaging to a patient. Since its endorsement by the High Court in 1992, the concept has received scant judicial attention. This article explains why. The legal landscape has changed and in terms of establishing normative causation, the nature of the Attwells v Jackson Lalic Lawyers Pty Ltd  HCA 16 and Kendirjian v Lepore  HCA 13, recognised the need for the immunity to exist, albeit with significantly narrowed scope. Generally, the principles and scope of expert witness immunity tend to follow that of advocate immunity. However, Australia is widely accepted as the most advanced judicial system supporting the use of concurrent expert evidence. This analysis discusses the unique position of Australia after these two High Court decisions that shape expert witness immunity, recognising the ongoing policy of protecting the finality of litigation. However, the legislature must be careful not to maintain this as the foremost reason for the immunity merely because the courts have chosen this pathway previously. Nor should the legislature merely maintain the status quo of expert witness immunity following advocate immunity. The professions of law and medicine make an important contribution to society, applying complex theoretical and practical knowledge to serve their clients and patients. Given the significance of these professional roles, it is vital that doctors and lawyers are well-educated and prepared for the challenging situations that will confront them in their professional careers. 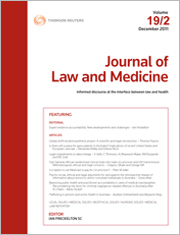 This article examines and compares education in law and medicine in Australia, with a focus on learning methods, assessment and feedback, integrating case studies from teaching in evidence law and ophthalmology subjects. The article evaluates opportunities to improve education in both fields through a series of comparative observations. Australia has recognised the need to cope with changing attitudes towards advocate and expert witness immunity. While some international jurisdictions have chosen to abolish the immunity altogether, Australia has most recently, via the High Court decisions in infringement on consumer rights. Alternative strategies should be considered to address obesity, including social action, education and information, and use of the media. Mental health statutes in every Australian jurisdiction contain penalties for breaching certain provisions. The Australian Capital Territory’s new Mental Health Act 2015 (ACT) is notable in using not only financial penalties, but also including specific offences and the possibility of imprisonment to regulate certain procedures related to the involuntary detention and treatment of those with mental illness. The penalties for committing the offences range from small fines to 12 months’ imprisonment. There is a concern that the threat of criminal punishment may discourage practitioners from routinely using the Act’s immediate detention procedure. Failure to adhere to extensive notification requirements can result in financial penalties. Private psychiatric facilities may also face particular penalties. The inclusion of separate provisions which are specifically labelled as offences in mental health legislation has received minimal attention. Criminalising aspects of mental health care creates stigma, may encourage defensive medical practice, and works against the recovery movement. There is a slow development of this trend in other health specialties. In Australia, access to administrative data for research without consent invokes a plethora of governance requirements. Whether these requirements are met is assessed by at least one human research ethics committee (HREC) and each of the custodians of the relevant data collections. In this article, we examined and compared the decision-making processes of data custodians and HRECs. These processes were investigated using three case studies and qualitative interviews with data custodians around Australia. The investigation demonstrated that there was significant overlap and duplication in the review of applications for access to data without consent between HRECs and data custodians. This was the result of overlapping requirements in the relevant legislation and policies with those in the National Statement for Ethical Conduct in Human Research 2007 (updated 2018) as well as confusion about the distinct roles of HRECs and data custodians. Introduction of a sugar tax on sugar-sweetened beverages (SSBs) has been proposed by peak health bodies and Australian politicians as a strategy to control behaviour that leads to obesity. The question is: what are the implications of imposing a sugar consumption tax on SSBs with the aim to curb the harmful effects of obesity? Arguments for and against a sugar consumption tax pose an ethical dilemma. While evidence supports the implementation of a sugar consumption tax as effective in curbing SSB consumption within certain populations, ethical considerations support the premise that autonomy trumps justice, beneficence, and non-maleficence. Legal implications include the consideration of Commonwealth and State jurisdiction, discrimination against a person’s disability, such as obesity, and duty to warn and its underlying policy provision supports a judgment strongly in favour of patient autonomy. Given the legal commitment to patient autonomy, together with the wider protection that a mentally competent patient has an absolute right to decide whether or not to undergo medical treatment, the concept of therapeutic privilege is redundant. Against an established claim in negligence, therapeutic privilege is no defence. Embryo donation offers a potential solution to infertility for recipients of donated embryos, and also provides an alternative option for donors who do not wish to dispose of their surplus embryos after completing their own family through in vitro fertilisation. Embryo donation is an efficient and successful treatment for infertility, however the intentional division of social and genetic parenthood raises complex ethical issues. In New Zealand embryo donation for reproductive purposes comes under the remit of the Human Assisted Reproductive Technology Act 2004 (NZ) (HART Act). The principle in s 4(a) of the HART Act requires that the health and wellbeing of children born as a result of an assisted reproductive procedure be an important consideration in all decisions about that procedure. This article examines the application of this principle by the Ethics Committee on Assisted Reproductive Technology (ECART) in its consideration of applications for embryo donation for reproductive purposes. It concludes that ECART’s consideration of the principle in s 4(a) should be focused on mitigating any issues that might arise specifically as a result of using embryo donation as a form of reproduction. This article analyses new legislation regulating advance directives in Italy. On 14 December 2017, the Italian Senate passed a Bill regulating end-of-life decisions by codifying patients’ rights to self-determination. It is the first law governing advance directives in the Italian legal system. This article studies and critically examines the two types of advance directives through an Italian legal perspective – living wills and nominations of a surrogate. It also applies a legal comparison approach. In its conclusions, this article advances some policy suggestions. For the PDF version of the table of contents, click here: JLM Vol 26 No 3 Contents.